Sometimes you will not have any warning prior to a sinkhole developing, as it may come about within hours or minutes. But other times, there are signs leading up to a sinkhole collapse. When the sinkhole is on the outskirts of the commercial property, you may not be aware of it. However, if the sinkhole in Florida affects a specific area of the building, you will most likely see signs of structural issues. These signs will warn you that something is not right before a sinkhole fully develops. Determine the best options for foundation stabilization. Help guide you through the insurance claim process. Streamline communications with all involved. Deliver a World Class customer experience. What are common sinkhole signs to be aware of? But, what even causes them to begin with? Ruptured sewer lines contribute to some urban sinkholes, but generally they are naturally recurring phenomenon characterized by sudden settlement or collapse of land. Most of the time, they happen when underground water or seismic activity creates voids or chasms underneath the surface of the earth. When topsoil becomes heavy with rainwater, or is subject to some other stressor, or even simply from gradual groundwater erosion, the surface collapses into the void, and a sinkhole forms and swallows whatever was sitting on top of it. Areas built on soft rock, such as limestone, and near underground aquifers are particularly susceptible to sinkholes. While they are found all over the world, the area’s most at risk in the United States are here in Florida along what many call Sinkhole Alley representing Hillsborough, Pinellas, Pasco, & Hernando Counties. Florida residents can look here to see where subsidence reports have been filed in their neighborhood. Click on the button below. 3. Cover-collapse sinkholes. Perhaps the most well known of sinkholes, cover-collapse sinkholes are also the most dramatic. The surface area above the bedrock in this instance is mostly clay, spalls into the cavities. But since the clay is sturdy, arches form as it slowly spalls. This arch continues to support the surface ground until it becomes so thin that it collapses into the cavern below, swallowing up everything above it. The most important thing to keep in mind is the structure of your insurance and risk management plan. Standard landlord and multi-family structural insurance policies do not normally cover sinkhole risk. If you look in your policy, you’ll almost invariably find sudden earth movements to be excluded. Because the sinkhole risk is not relatively uniform from location to location, you must normally purchase sinkhole coverage separately, just as you do with flood, earthquake and windstorm insurance. If you aren’t covered, and your property is damaged thanks to a sinkhole, you’ll be out of luck. Some states, including Florida and Tennessee, require that property insurers offer it, but you may have to opt-in. In Florida, which has a lot of multi-family dwellings and over 19,000 identified sinkholes, insurance companies must make it available for an additional premium. 4. The insured structure being condemned and ordered to be vacated by the government agency authorized by law to do so. As with flood insurance, you should assess structural building insurance and contents coverage separately, especially if you’re leasing furnished apartments. This was a big concern for the Summer Bay Resort, of course, since it’s a vacation destination and therefore the owners had a substantial investment in furnishings in each room. Your tenants should secure their own renters insurance policy if they want their belongings covered in the event of a sinkhole destroying their personal property. (Note: those occupying structures damaged by sinkholes should not assume they’ll be able to recover their property. Tenants in some situations never were able to recover their personal belongings). How do I tell if I might have a sinkhole? Sinkholes usually take people by surprise. But there are some early warning signs that may occur before a catastrophic ground cover collapse. Below are some signs of possible sinkhole activity. The more that you have, the more important it is to have your home inspected and evaluated immediately. Do any of your doors (including screen doors) have trouble closing or opening? Do any of your windows "stick" and “jam” or can be tough to open? Does your electric or water bill seem too high? Have you experienced any odd plumbing problems on your property? Are the cabinets and drawers in your kitchen and bathroom normal and level? Has a gap formed between your kitchen/bathroom counter backsplash and the wall? Have any shower tiles loosened, cracked or popped off? Is there any separation, or gaps, between any of your walls and the ceiling? Is there any separation, or gaps, between any of your walls and the floor? Are there any cracks in your interior walls? Is there cracking or cracks around the corners of door and window frames? Do you have any cracked or "hollow" sounding floor tiles? Are there any cracks in your floor in common areas? Are there any odd water spots or discoloration in any walls or ceilings? Have there been any water leaks or flooding when it rains? Do you have any cracks in your driveway or streets inside the complex? How wide are they? 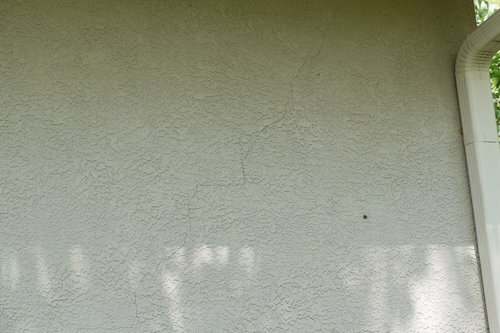 Do you have any cracks in your exterior walls? How wide? Do you have any cracks around windows? Do any cracks look like “stair steps” going up or down? Do you have any cracks in your garage walls, floor or ceiling? Are there any "normal settlement" cracks that seem to be growing? Have any of the cracks grown longer or wider? Do you have any loose or odd roof tiles? Do you have any "dead patches" of grass or shrubs in your yard? Does your yard slope in any direction? Are there any slight dips or depressions in your yard? Are there any holes in your yard? Has your fence or retaining wall moved, shifted, or cracked? Is there a lake, canal or drainage pond nearby? Previously underground areas of fence posts, trees and the building foundation itself that is now exposed. This means the ground around them is sinking. Ponds collecting in new places after rainfall. Deep, narrow holes down to the aquifer. Have any units in your complex had sinkholes? Have any neighboring buildings had a sinkhole? I might have a sinkhole. Now what? If you inspect your property and find signs of sinkhole damage, the next step is to call your insurance company. Before you do so, have a copy of your insurance declarations page handy. Keep the initial call short and sweet. They will ask you a series of questions. Probably just name, policy number, what type of damage you are seeing and when you first noticed it. Even if my property has some of these signs, is it possible that I do not have a sinkhole? Thankfully yes. Many of these damages can be caused by settling of the home or a loose joist on your foundation. Your insurance company will do an inspection, but keep in mind that sometimes insurance companies will blame other causes incorrectly. Business interruption. If you have to evacuate your whole structure, you won’t be collecting rent. Will you be able to make your monthly obligations without rental income coming from your tenants? Utility Interruption. Suppose a sinkhole doesn’t damage the building itself? In Florida, it wouldn’t qualify using the state’s legal definition of sinkhole, which requires that the structure itself be damaged. But if it ruptures a gas or water main, or destroys your septic or sewage system, you still have a problem. Consider what an extended loss of communication, water, sewer, gas and electricity would do to your bottom line. You filed a sinkhole claim. Now what is the process? What should you expect from your insurance company? What should you say or not say so that your claim has the best chance of getting approved? Usually, within a few days, you will get a call from your adjuster. They will schedule an inspection and a time to talk to you. The inspection should take about an hour. Get ready for your adjuster inspection. Clean up your property. Pictures will probably be taken, and just on case you end up in court you want to look responsible. Think through what you will say. Don't get too chatty. The adjuster is working for the insurance company, not you. It is their job to prevent the insurance company from paying out unnecessarily. Answer the question with facts that you know and say as little as possible. Don't guess. If you don't know the answer, just say so. If you don't remember, say you don't. There is nothing wrong with not remembering. Timeframes are important. If you noticed the cracks in your wall 3 weeks ago, say so. If you tell the adjuster that you have no idea how long they have been there, and that they have been there since you bought the house, they could deny your claim based on the possibility of pre-existing damage. Geological testing is the next step. Your insurance company is obligated by law to have a testing company confirm or deny that sinkhole activity is causing damage to your property. You will probably get a notification from your adjuster that a testing company has been assigned and a call from the testing company to schedule a time for their visit. The testing will include a detailed inspection of your property, followed by different types of Geophysical tests such as radar and drilling. A few weeks after the testing, your insurance company will forward you a thick report. These are usually standard reports slightly modified for your situation. Not long after the report, you will be notified of the insurance company's decision. This should take a relatively short period of time. If it has been weeks or months since you have received the report, you may want to contact an attorney. Once you have made it through the sinkhole claim process and your insurance company has approved your claim, the repair process starts. How disruptive will this be to my life? Will my property retain its value after the repairs are done? How do I ensure that my tenants are safe during the process? It will be your responsibility to get bids from sinkhole repair companies, as well as cosmetic repair contractors. The sinkhole repair company must be a state licensed, certified geotechnical or structural engineer. Your insurance company may recommend some. As sinkhole claims rise all over the state of Florida, and insurance companies continue to change the way they handle them, property owners have more and more questions about them. This seems like a no-brainer, but unlicensed and uninsured contractors abound in Florida. It is important to check. Helicon is licensed for the entire state of Florida and has successfully completed thousands of commercial and residential projects. If they are, check their ratings and reviews. We are listed on the Better Business Bureau and have a A+ rating. You can also check on Google, Angie’s List, Yelp, Facebook, and Houzz. Is your company a full member of the Florida Association of Sinkhole Repair Specialists (FAS3)? Helicon is a proud and active member inside FAS3 which provides engineers, geologists and contractors with up to date information about sinkholes, remediation processes, innovations and new equipment. How many years of experience do you and your staff have in sinkhole repair? Select a company whose primary experience is sinkhole repair. Many General Contractors with years of experience in general construction will take on sinkhole repair jobs when construction is slow. Work with someone who is focused on sinkhole remediation. How up to date are your methods and tools? You don't have to understand how everything works. You do want to know how well the company has kept up with new advances in the sinkhole remediation process. Ask them what equipment advances they have made since they have been in business. May I speak with some of your customers? If the company is reputable, they should be able to give you some verified testimonials. You may be able to walk a job site with a foreman. A sinkhole repair company will be in and around your property for a few weeks, maybe even a month during the repair process. For this reason, it is important to select one that you are comfortable with. After you have considered the "hard facts", consider how the company representatives made you feel about the process. Were you given a hard sell, or did they seem to want you to be an informed customer? Trust your gut. If you’re in sinkhole alley, take nothing for granted. Read your landlord’s insurance policy or commercial insurance property and understand the details, including how your policy defines sinkhole/ground cover collapse hazards and what is and isn’t excluded. If your property is geologically at risk of sinkhole damage (which isn’t limited to Florida), expect to buy separate coverage, just as you do with flood insurance or windstorm/hurricane insurance.